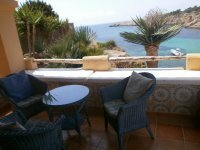 VILLAS AND APARTMENTS TO RENT IN IBIZA, SPAIN. Welcome to our selection of holiday homes to rent in Ibiza, Spain. Ibiza is an island known for its wild nightlife. Some four million visitors head there every summer in search of the notorious nightlife that the island of Ibiza has to offer. However, there is a lot more to this stunningly beautiful little island than its nightlife, the northern half of the island is made up of unspoilt forest which proves very popular with cyclists and walkers. The coastline of northeastern Ibiza consists of countless small coves and some of the island's most charming beaches. Looking for self catering holiday accommodation in Ibiza? Then below is a selection of holiday apartments in Ibiza and holiday villas in Ibiza that can be rented direct from their owners. You can either click on each listing for further details or you can use our search engine on the left if you are looking for something in particular.